On the 12th April, 1961 cosmonautics history as well as the whole world science saw the upmost event: for the first time a human dared to travel outside the atmosphere. 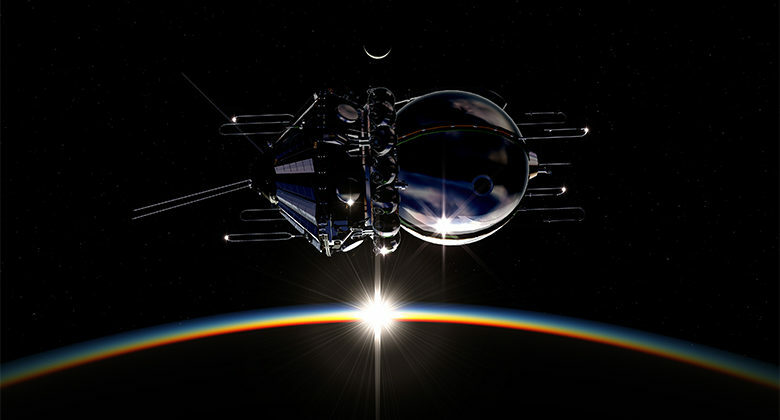 Yuriy Gagarin, an astronaut who manned the Vostok spacecraft with his famous “Let’s go!” started the era of space flights. He discovered a way to other worlds for the humanity. This event needed years and even centuries of scientific search, numerous scientific works on the realization of human age-old dream “to conquer the sky”. Among them, there is a great work of Konstantin Eduardovich Tsiolkovsky, who as far back as 1903 designed the first rocket for interplanetary communications. ; productive activity of Sergey Pavlovich Korolev, the author of the first intercontinental ballistic missile R-7, which launched the first satellite into orbit; and long hard work of many other researchers, without whom “Vostok” would not have been launched. And, at 9:07 am Moscow time, on 12th April, 1961, the dream of many people came true – in several tens kilometers to the north of Tyuratam village in Kazakhstan, from Baikonur Cosmodrome, the sputnik rocket, which put into orbit a Soviet spacecraft “Vostok” with a human aboard, was launched. The flight lasted 1 hour 48 minutes (108 minutes). During the time on the orbit, Gagarin stayed in touch with the Earth, observed through luminaires, controlled the spacecraft system functioning. After one circle around the orbit, the reentry module landed in the Saratov region, on the USSR territory. According to the set program, when “Vostok” was several km from the ground, the astronaut was ejected and landed via parachute near the reentry module. 108 minutes are almost nothing in time, but what an importance had this first flight for the science development. Just in a month, the first suborbital flight of an American astronaut Alan Shepard and the first day-long manned space flight occurred. Several years after, the first multiple person spaceflight of “Vostok 3” and “Vostok 4” and the first American orbital flight of John Glenn, who flew around the Earth three times, took place. Just 20 years after the first manned space flight, on 12th April, 1981, the first piloted flight from “Space Shuttle” program started… The space exploration continued its fast development, and nowadays scientists are working on the first spacecraft launch to the Mars. Since 1962, April 12th became a national holiday in the USSR. In November, 1968 at FAI congress it was decided to celebrate the 12th of April as an International Aviation and Cosmonautics Day. On April 8, 2011, on the eve of 50th Anniversary, General Assembly of the UN adopted a resolution, which declared 12 April a Space Probe Day. In this memorable day, we appreciate those, who discovered the great space of the Universe for us and continue doing it. We wish good luck to those, who are now on the orbit. So, just look up at the infinite starry sky and imagine yourself as a part of still unexplored Universe.